'Atari Dump' Will Be Excavated, After Nearly 30 Years : The Two-Way After nearly 30 years, the New Mexico landfill that famously was used to bury the game console maker's mistakes — the biggest being the game E.T. The Extra-Terrestrial — will be dug up by game developer Fuel Industries, which hopes to make a documentary about the project. The "Atari Dump" of New Mexico, where the game company rid itself of unsold game cartridges, will be excavated this summer. 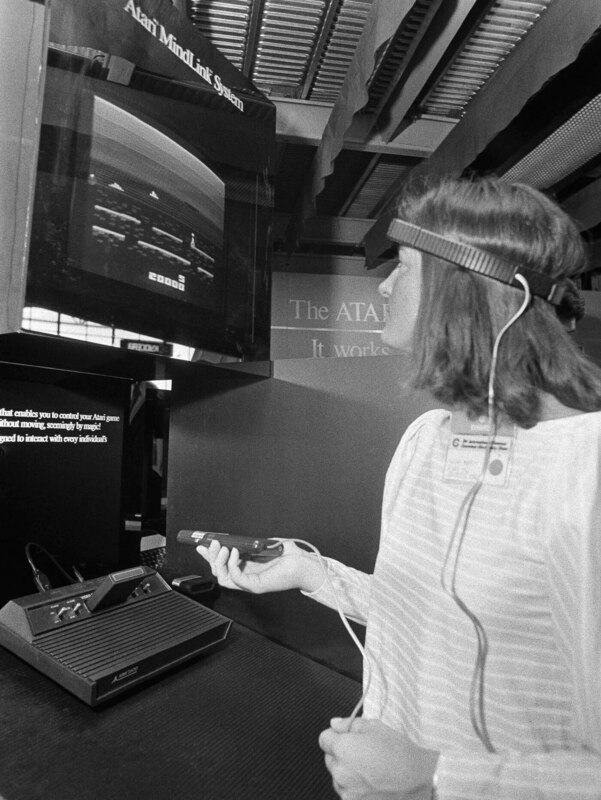 Here, a file photo shows a woman demonstrating Atari's unreleased 1984 Mindlink device, using a headband that picks up impulses from movement of the player's forehead. Also known as the "Atari Graveyard" or the "E.T. Dump", the desert landfill is the spot where Atari decided to permanently off-load tons of games that were sitting unsold in a warehouse in El Paso, Texas, in 1983. So they went to a dump in Alamogordo, N.M. This week the city council voted to allow Fuel to excavate. "That September, according to newspaper accounts, 14 trucks backed up to the dump and dropped their loads," the blog Western Digs reports. "Company spokespeople told the local press that the waste was mostly broken and returned merchandise — consoles, boxes, and cartidges." The move came as Atari shifted its manufacturing business overseas to China. It also just had to find something to do with all those E.T. games. "The rumor is that Atari decided to deal with its oversupply by simply burying all of those extra cartridges in the Alamogordo landfill, crushing them with bulldozers and covering them with cement," wrote Flickr user Thomas Schrantz in a caption for a photo of the dump taken in 2010. "Reportedly, other items were also dumped, including returned Pac-Man cartridges, broken Atari computers, and perhaps even prototypes of unreleased hardware," Schrantz writes, engendering hopes (in a few people, anyway) that early versions of Atari's ill-fated Mindlink device might be among the finds. As Western Digs reports, news of the excavation shows how the detritus of our electronic culture can morph into artifacts. That's not to say that all outdated technology is mere trash: Consider that last weekend, a vintage Apple-1 computer, made in 1976, sold at auction for $671,400, as NPR's Sam H. Sanders reported.